Enjoy 4 days of luxury and romance in the Whitsundays! Sail on a beautiful catamaran for 2 days of luxury! Looking for a short getaway in the Whitsundays? The popular Blue Coral Package is your answer. 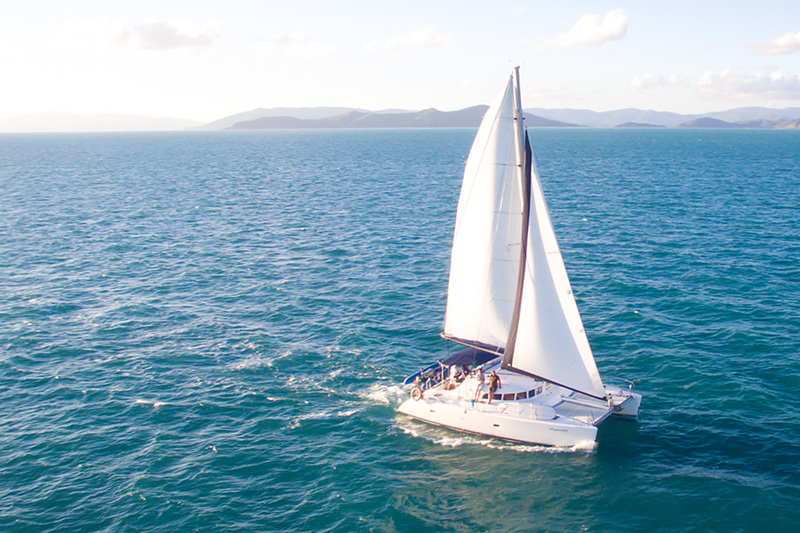 Spend 4 luxurious nights in the Beautiful Whitsundays, with this delightful sail and stay package. Guests enjoy 2 nights on board the luxury catamaran Whitsunday Blue in a Double ensuite cabin and can enjoy a further 2 nights at the exclusive Coral Sea Resort in a Garden view double room with tropical breakfast. Sail into paradise on board Whitsunday Blue and create memories that will last you a lifetime! Taking out a maximum of only 8 passengers, you are guaranteed a relaxed and intimate setting that is perfect for honeymooners and couples. Our experienced crew will take you to all the hot spots of the region and choose from fun activities such as snorkelling, bush walking, sailing or sit back and relax, soak up the sun and let our crew take care of everything else. Whitsunday Blue is a very spacious vessel. She has four private cabins (2 queen sized beds, 2 double sized beds) and the saloon will seat everyone comfortably for dinner. The large aft bimini offers substantial shade to hide away from the sun if you would prefer. The spacious lounging area on the foredeck has two huge comfortable nets to lounge around on whilst you soak up the Whitsunday sunshine. Your 2 night cruise departs from the near by Abell Point Marina. Custom built in France for luxury charter, the interior layout comprises four private double cabins each with ensuite and flatscreen DVD players. You will be well looked after by a professional Skipper and very attentive host. See the magnificent Whitsundays in Style. 74 Islands...a thousand choices! Coral Sea Resort is located within the exclusive sea-side enclave of Airlie Beach, positioned on paradise point, and is an oasis of luxury and tranquillity just moments via seaside boardwalk to the enchanting Airlie Beach. There is a uniquely nautical feeling in each of the spacious suites, which reflect the wonderful yachting heritage of the Whitsundays. Soft nautical colours, historic boating prints, polished timber and yachting memorabilia adorn many of the Resorts rooms and dining areas complete our superior Whitsundays accommodation. The adjoining marina, linked by a boardwalk to the Resort, offers those with salt in their veins a chance to wander through the amazing array of charter yachts and luxury vessels to work off breakfast, lunch or dinner, indulged in at our award-winning Clipper restaurant. Minimum age is 18 year old and guests must be able to swim if they would like to snorkel. This sailing adventure is only suitable for active people and a basic level of fitness and mobility is required. Whitsundays - Please bring only a small soft bag with: change of clothes, hat, swim-wear, beach towel, sunscreen 30+, warm pullover for the evenings (seasonal). You will also need to bring your own alcoholic beverages, available for purchase in town. No glass bottles please. Whitsundays - Skipper, host, drinking water, meals, linen, bath towels, wetsuit hire and snorkelling equipment and all Marine Park fees. Whitsundays - All cancellations made 30 days prior to travel will result in a 25% cancellation fee of the total price. Cancellations 14 to 30 days before departure, loss of 50% of ticket price and 14 days to departure will result in forfeit of full trip fees. If the sailing company has to cancel the trip (prior to the boat's departure) and we cannot offer a suitable alternative, then a refund will be given minus card fees. We strongly recommend that you have travel insurance, especially during the wet season. Acccom - All cancellations will forfeit the deposit paid at time of booking. Your credit card details will be passed on to the accommodation to secure your booking. Any cancellations within 14 days will forfeit full amount. We strongly recommend that you have travel insurance.